Last week my alternate column colleague, Fr Kevin Hegarty, was critical of my article on the Corrib gas project. He singled out the use of the word ‘debacle’ in the headline. I would like to bring to his notice that the headline ‘Corrib Debacle Continues’ was inserted at the sub-editing stage. My headline was ‘Cavalier Corrib Marches On.’ I might add that the use of the word ‘debacle’ in the headline is something I wholly agree with. I used the word in the body of the article to describe the ‘recent tunnelling convoy debacle.’ I make no apology for its use. I made two phone calls to Shell offices in Mayo and Dublin the previous week for a comment on the cross-country convoy. I was not afforded the good manners of a reply to either call. Fr Kevin, acting I presume as an apologist for Shell in his column, is, perhaps, their response, I do not know. Fr Kevin described how good Shell is for the county and listed various support programmes that it has instituted for north Mayo. The trans-national company has done all of that but only after it and statutory bodies were challenged every step of the way by local people who questioned their motives in the area. He admitted that he is a member of Shell’s Third Level Scholarship Programme. How many people from the parish most affected by Shell’s work are on any of these committees? How many of the people whose lives have been and are being continuously disrupted by Shell and their private security firm are benefiting from these schemes? AS Shell announces ten long-term jobs for the controversial Corrib gas project, an environmentalist has warned that government ministers ‘should not be allowed to sacrifice the environment on the altar of corporate greed’. The ten trainee Production Operations and Maintenance Technicians will ultimately form part of the Corrib team running the refinery at Bellanaboy when the project is completed. THE Irish arm of Canadian resources firm Vermilion Energy, which is a shareholder in the Corrib gas project, recorded a €10.5m loss last year. That compared with a €27.1m profit a year earlier. The large disparity between the two figures -- revealed in the firm's latest filed accounts -- is due to the reversal in 2010 of a previously recorded €38.7m impairment, which inflated its profits that year. Without it, it had posted an €11.6m loss. SHELL TO Sea says it has received “further evidence” of monitoring of campaigners opposed to the Corrib gas project by a private security company. The group has released scans of pages from two notebooks, which it says comprises notes taken by security staff employed by Integrated-Risk Management Services (I-RMS). 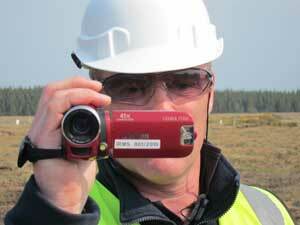 I-RMS is employed by Shell EP Ireland and Corrib gas developers on the project. 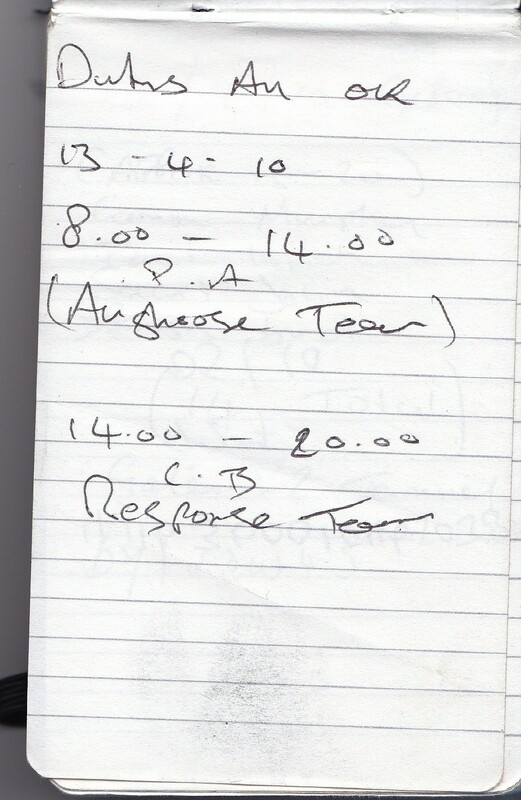 The notebooks with records dated between April and June 2010 included names of campaigners, and a reference to a “covert camera”. Among the notes made was one which stated "VU Covert Camera Not in Box I-RMS 10" and also how the security went on the 5th June 2010 (while a gathering was taking place at Rossport Solidarity Camp) to “gather intel” and to take “Pics and names if possible”. The names of three campaigners are noted in one of the books. [Shell to Sea] Below are the scans images of pages from two IRMS notebooks that contain notes taken by IRMS personnel between April and June 2010 of their monitoring activites in the area. [Shell to Sea] Below is the IRMS report from the Aughoose compound which details the 24 hour surveillance that was carried out on the 29th June 2012. An Irish Times article on the report can be viewed here.